The calendar says it's springtime in New York City but after the 10,000 tons of wet snow we faced over the last few weeks, I'm over here scrolling through pictures of warmer afternoons in the Bahamas. Time to escape somewhere tropical, if only via photos. You’ve seen the amazing photos and videos of the perfect blue water, fine white sand, and the adorable swimming pigs who call the tropical paradise home. 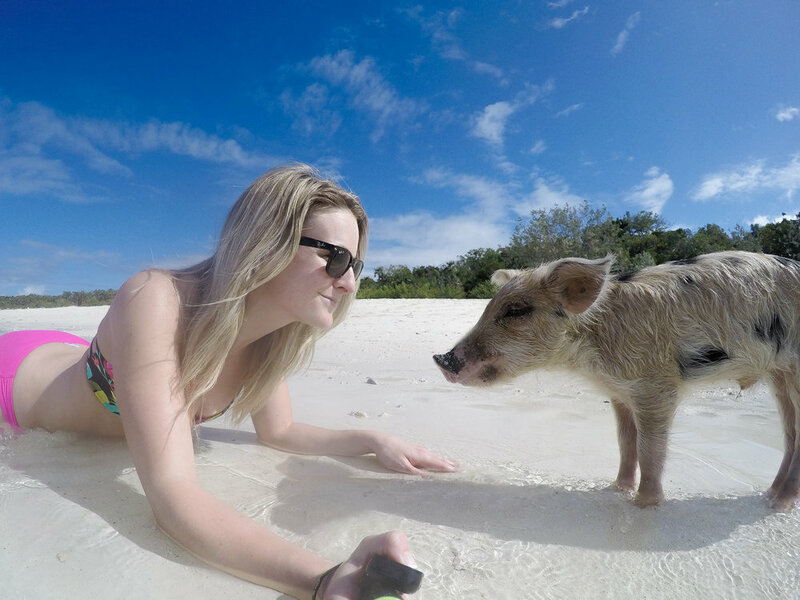 The famous swimming pigs of the Exumas are featured in music videos and photoshoots and they’re all over Pinterest and Instagram. Before visiting the swimming pigs of the Exumas, I thought a place so magical couldn't possibly be within reach or budget. I never thought this bucket list destination would ever be crossed off. But I was wrong. Last year I swam with the famous swimming pigs of the Bahamas. Now the Exumas are my favorite place on earth. It took hours of research and planning to get there. Some sites were outdated and slow. Many blogs gave conflicting information. The trip had so many moving parts from the flights to the lodging to finding the pigs themselves. It was complicated, but now I know how to make it happen. I've perfected and simplified the process so you can start planning your trip to see the famous swimming pigs of the Exumas. This is a true adventurers' getaway. This vacation, as I've planned it below, is not a trip for those who prefer an Americanized experience. This vacation is not for someone who needs a tour guide, a schedule, or concierge to make your plans for you once you arrive. This is not a low-budget vacation. If you can commit $3500-$4000 to a vacation, you can make this trip work for your budget. The Exumas make the perfect honeymoon, anniversary, or special occasion destination. This will make every other vacation pale in comparison. You will be captured by the spirit of the Exumas the moment you arrive. I can't explain it, but you'll know what I mean when you feel it. STEP 1. Pick your travel dates one year in advance. The Exumas are a remote area with access by private charter plane, yacht, or ferry (which can take several days). The best lodging options are booked well in advance by returning visitors. Traveling in September, October, and before thanksgiving in November will save you the most money, as this is considered off-season for the region. Rates are highest through holidays and March through August. STEP 2. Book your stay at Staniel Cay Yacht Club. 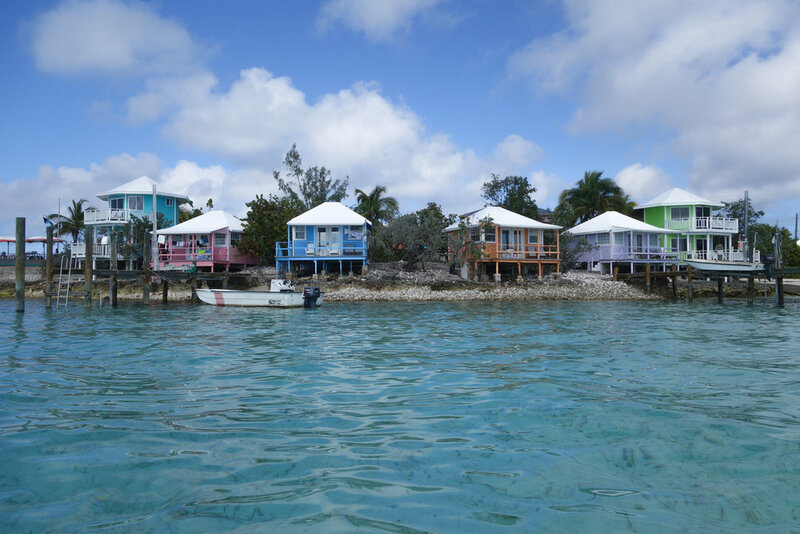 Staniel Cay Yacht Club on tiny Staniel Cay is a collection of vintage bungalows modernized to suit the amenities of today's traveler, while maintaining a secluded and peaceful air not found at massive all-inclusive resorts. Each bungalow boasts an unobstructed water view. 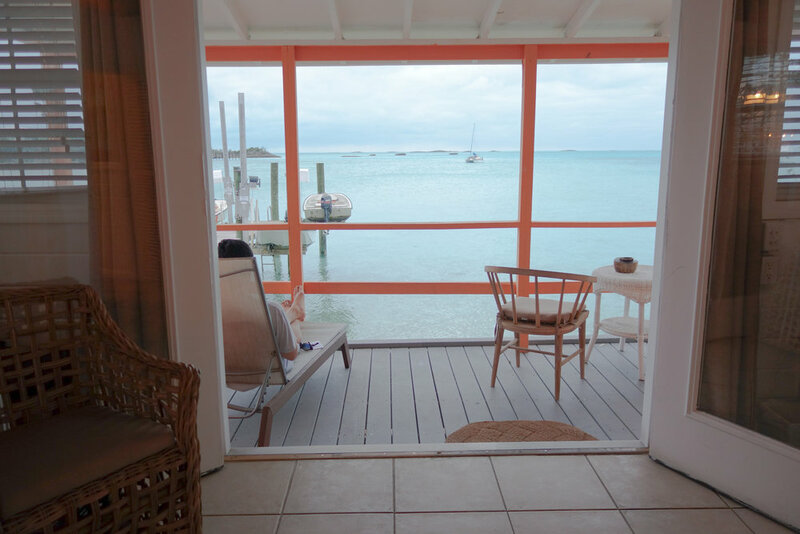 The original bungalows, pictured above, are perched on top of the water at high tide allowing the native nurse sharks to swim just feet away from your private deck. The main clubhouse features a big horseshoe bar, billiards tables, and a few TV screens (for watching football, they're big on the Patriots) while the attached dining room is freshly renovated with a light and airy design. The best part about Staniel Cay Yacht Club, and the selling point for us as we planned our swimming pig adventure, were the skiffs. Each bungalow rented with an all-inclusive package is provided with a 13' to 17' Boston Whaler boat with gas for use during your stay. I just got a wave of goosebumps thinking about our mornings at Staniel Cay, loading into our watercraft and setting off for a day of exploring with no one to tell us what to do or where to go. Yes, the staff provide you with a quick lesson on the boat if you need it, the navigational charts needed to get where you want to go, and a radio if you should get yourself into a pickle and need to contact the yacht club. 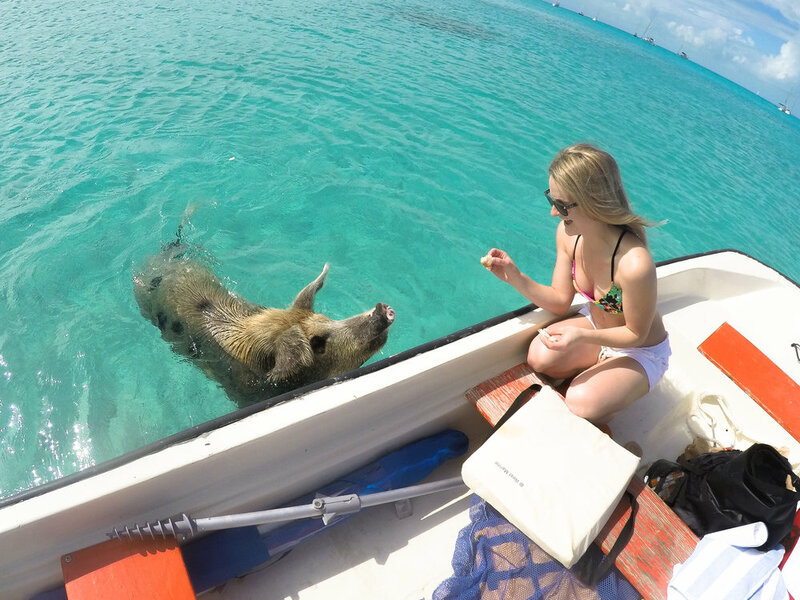 With your own skiff you can visit the pigs as much as you want, as well as the other surrounding islands with even more incredible things to discover. The island of Staniel Cay offers other lodging options, including private rentals, but for first time visitors looking to get the most out of their stay, SCYC is the only place you want to be. The Staniel Cay Yacht Club booking system is pretty old school compared to other hospitality sites. When your resort is fully booked up to a year in advance, you really don't need a flashy system! Dates over a year in advance may require a phone booking. The booking office is great to work with and will help you reserve the dates for your travel. What do the different names of the bungalows indicate? The bungalows with color names (Pink, Blue, Orange, Lavender, Yellow) are the original bungalows dating back to the 1950s. They are the most affordable bungalows, and in my opinion, the best of the group because of their placement on the water and distance from the bustle of the main clubhouse. The suites (Key Lime, Ocean Blue, Periwinkle) can accommodate more than two people. Buttonwood, Sea Grape, Coco Plum Suite, Sugar Apple, and Dilly Gum are the newly constructed bungalows set a little further back from the water, but boast king sized beds and newer bathrooms. These bungalows also come with the larger of the skiffs in the all-inclusive package. So many different prices listed. What does it actually cost? All you need to worry about is the package rate per person, which includes the bungalow, the boat, three meals per day (including a boxed lunch, which we utilized every day), one non-alcoholic beverage per meal, snorkel gear, bikes, paddle boards, and kayaks. The cheapest way to stay at SCYC is during off season in one of the color name bungalows with a rate of $185 per person, per night. For $370 per night (taxes and fees excluded), you and your travel partner get to stay in a private bungalow, have every meal prepared for you, and use your private boat to island hop all day long. You won't find a deal like that at a massive Americanized resort in Nassau! If you want to save money on adult beverages, just grab a bottle of rum at the local market for drinks in your cottage. My dates are booked. How can I stay at SCYC? Are you cool with moving between different bungalows during your stay? One bungalow may be available for three nights while a bungalow two doors down is available for two nights later in the week. Those five consecutive nights in two different bungalows are better than no nights! You can also ask to be placed on a cancellation list for your dates. Do I have to pay for my stay when I reserve the bungalow? Nope! You'll put a credit card on file. Cancel 21 days in advance if you can't make your trip. Look over the policies at SCYC before booking so you know what taxes and fees to expect on check out. STEP 3. Book your commercial & charter flights. Chartering a flight sounds high end and expensive, but it's not just for the uber rich. A charter flight is the best and quickest option for getting to Staniel Cay. Otherwise you're looking at a days-long journey on a mail boat. If you have limited time in the Exumas, face your fears and board that tiny plane to the island. In the interest of honesty, I'll tell you that we will probably never fly Flamingo Air again. However, this was the cheapest option at the time. 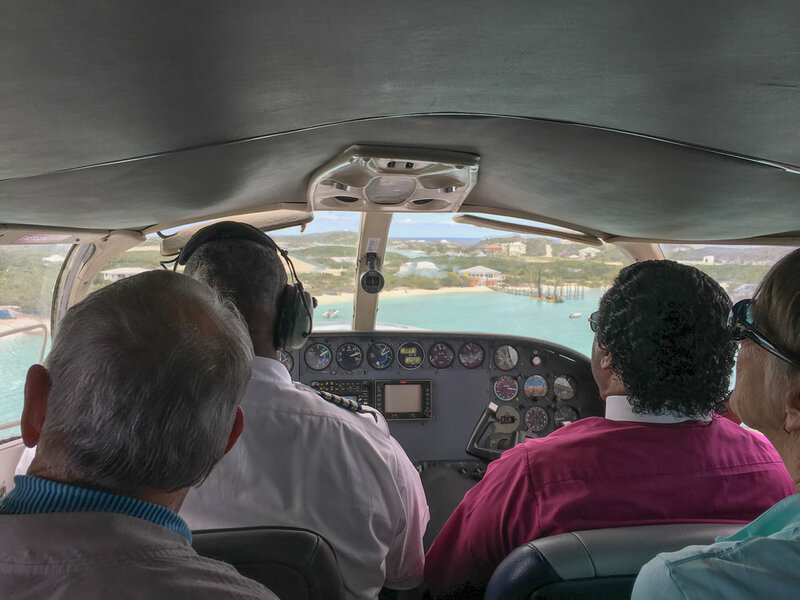 We flew from Portland, Maine to Nassau (one connection in between) and had quite the experience aboard the tiny private plane to Staniel Cay. The customer service was less than stellar, the plane simply looked run down, and the history of crash landings that I discovered after our trip was a real turn off. Still, plenty of people enjoy their quick trips with Flamingo Air to get to and from Staniel Cay. SCHEDULE: Daily flights departing at 8:00 a.m. & 4:00 p.m.
Watermakers Air is owned by the same company that owns Staniel Cay Yacht Club, so flying Watermakers means you're keeping it all in the family. You'll fly into Fort Lauderdale-Hollywood International Airport and grab a cab to Fort Lauderdale Executive Airport about 20 minutes away. The Watermakers planes are simply gorgeous and much of the fleet is new and state-of-the-art. The flight is longer and therefore more expensive, but it will balance out with the cost of the commercial flight. PLUS, Watermakers Air offers a discount to SCYC cottage guests, so book your flight over the phone to get the best price! STEP 4. Prepare to meet the pigs. You've arrived at Staniel Cay Yacht Club! Once you settle into your cottage and enjoy a meal of fresh conch chowder and grilled mahi-mahi, you'll be ready for one of bartender Carl's peanut coladas (yes, peanut) and a good night's sleep. You'll want to visit the pigs in the morning when they're the most active and hungry. The SCYC staff know that the swimming pigs are a big highlight when visiting the Exumas, so they'll provide food scraps from the kitchen to feed the piglets when you arrive. The staff will also show you on your chart of the islands how to navigate the quick 10 minute boat ride over to Big Major Cay where the pigs live. Navigating on the skiff is quite easy, but of course, be aware of the tides, shallow coral areas, and other boaters. Once you arrive on the beach, be ready for a semi-stampede of pigs large and small. They've come to associate the noise of boat engines with food. Even more clever, if you've brought one of SCYC's box lunches in a red and white cooler, the pigs know you've got more snacks in there. We had some scary close-calls with a massive adult pig trying to climb aboard the boat for our food. They can and will tip the boat. They can and will bite! These are powerful animals, and although they're cute, you should remain cautious around these wild creatures. Bring a GoPro and take a million pictures. Visit in the morning when the pigs are most active. If a pig gets too assertive looking for food, through your arms in the air like you're performing the "Y" in the YMCA dance and shout, "Yah!" 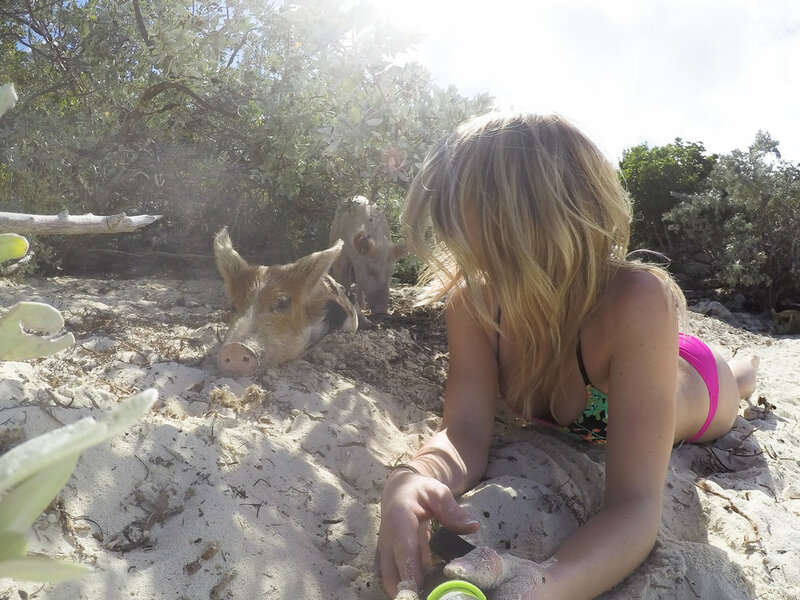 It should only take one or two tries before the pig understands your signal and retreats for another spot on the beach. The pigs were the draw, but what we discovered at Staniel Cay and in the Exumas was more than we'd ever imagined. With the complete freedom of a personal boat, we were able to island hop all day long. We claimed entire islands for ourselves. We explored an island covered with rare wild iguanas. 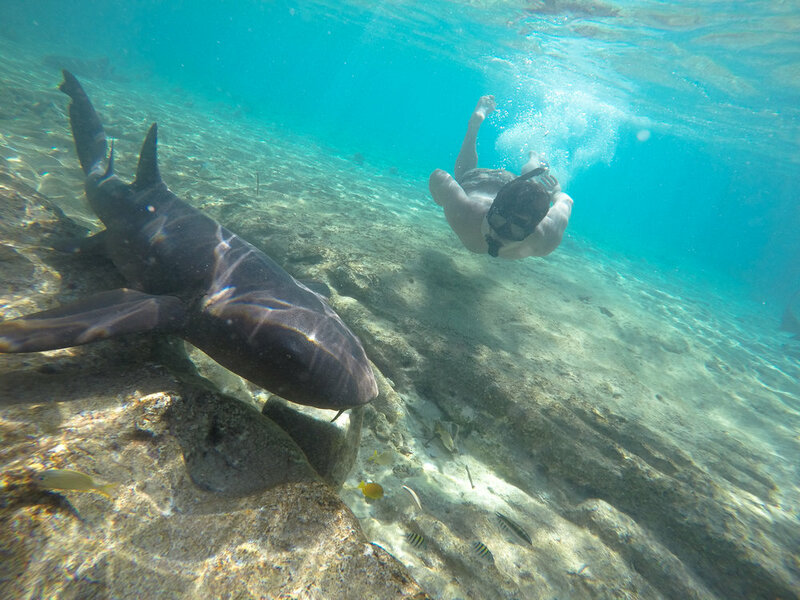 We swam with nurse sharks in the marina of Staniel Cay Yacht Club. We snorkeled a sunken drug smuggling plane just off the shores of Staniel Cay. We dove the famous Thunderball Grotto. If you want to cross the swimming pigs off your travel bucket list and need a little help planning, please let me know! I love gushing about the Exumas and Staniel Cay Yacht Club, so I'd love to help you make the dream real. Getting out of the city? Subscribe. Don't worry! I respect your privacy and I'll never share your e-mail.